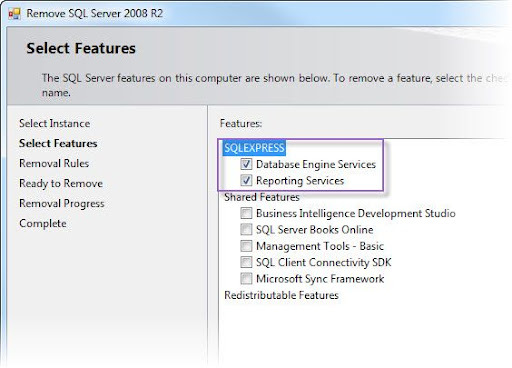 After installing Visual Studio 2010 I, inadvertently ended up with SQL Server 2008 Express having already installed SQL Server 2008 Developer. Only when I was going to upgrade to SQL Server 2008R2 I found out I had two instances installed. I looked everywhere for a place to remove the SQLEXPRESS instance but couldn’t find it. 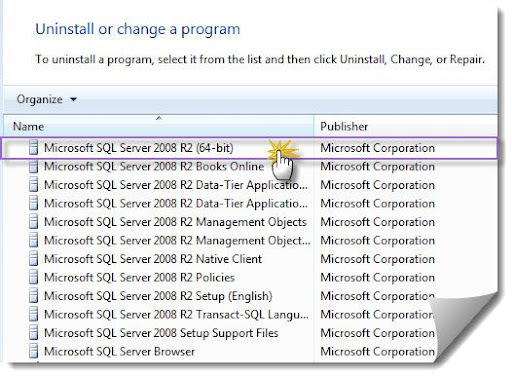 Only when I decided to uninstall the entire SQL Server suite and start over I found how to do it. 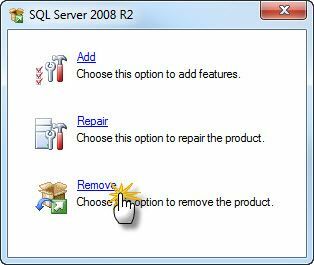 On Windows 7, go to Programs and Features and choose Microsoft SQL Server 2008 R2 (64-bit) (or whatever your version of SQL Server you want to add or remove and instance from). Choose Remove (or Add, if you want to add a new instance). Follow the steps and choose which instance you want to remove. Select the features of that instance you want to remove (select all to remove the instance). Note: Don’t remove shared features if you don’t want to remove any other instances. It’s probably something I should have known, but I didn’t and it wasn’t easy to find. With all developed and tested on my laptop using SQL Server 2008, it’s time to deploy to the company’s test machine running SQL Server 2005.
which is not present in the current database. but that operation has failed (reason: 2(The system cannot find the file specified.)). [ : System.Diagnostics.Eventing.EventProvider::EtwRegister][mdToken=0x600003b][offset 0x0000003D][found Native Int][expected unmanaged pointer] Unexpected type on the stack. [ : System.Diagnostics.Eventing.EventProvider::EncodeObject][mdToken=0x6000046][offset 0x00000000] Unmanaged pointers are not a verifiable type. [ : System.Diagnostics.Eventing.EventProvider::WriteMessageEvent][mdToken=0x6000047][offset 0x0000003C][found ref 'System.String'] Expected numeric type on the stack. [ : System.Diagnostics.Eventing.EventProvider::WriteEvent][mdToken=0x6000049][offset 0x0000012E] Instruction cannot be verified. [ : System.Diagnostics.Eventing.EventProvider::WriteEvent][mdToken=0x6000049][offset 0x00000030] Instruction cannot be verified. [ : System.Diagnostics.Eventing.EventProvider::WriteEvent][mdToken=0x600004a][offset 0x0000005F][found ref 'System.String'] Expected numeric type on the stack. [ : System.Diagnostics.Eventing.EventProvider::WriteEvent][mdToken=0x600004b][offset 0x00000010][found unmanaged pointer][expected unmanaged pointer] Unexpected type on the stack. [ : System.Diagnostics.Eventing.EventProvider::WriteTransferEvent][mdToken=0x600004c][offset 0x0000007D] Instruction cannot be verified. [ : System.Diagnostics.Eventing.EventProvider::WriteTransferEvent][mdToken=0x600004c][offset 0x00000309][found Native Int][expected unmanaged pointer] Unexpected type on the stack. [ : System.Diagnostics.Eventing.EventProvider::WriteTransferEvent][mdToken=0x600004d][offset 0x0000001B][found unmanaged pointer][expected unmanaged pointer] Unexpected type on the stack. CREATE ASSEMBLY for assembly 'System.Core' failed because assembly 'System.Core' is not authorized for PERMISSION_SET = UNSAFE. The assembly is authorized when either of the following is true: the database owner (DBO) has UNSAFE ASSEMBLY permission and the database has the TRUSTWORTHY database property on; or the assembly is signed with a certificate or an asymmetric key that has a corresponding login with UNSAFE ASSEMBLY permission. If you have restored or attached this database, make sure the database owner is mapped to the correct login on this server. If not, use sp_changedbowner to fix the problem. CREATE ASSEMBLY failed because method 'ShortPropsToXml' on type 'ShortProps'  in safe assembly 'Esi.SA.Encyclopedia' is storing to a static field. It had to be with PERMISSION_SET = UNSAFE. After successfully loading the assemblies, I was finally able to create the Transact-SQL definitions for the functions (see Part I and Part II). Now the DBAs won’t definitely let me use this, but it was fun to build it. You might have noticed that I used LINQ in my last Playing With SQL Server CLR Integration posts (Part I, Part II). On my last post, I showed how to convert a property bag stored in text to a CLR Table-Valued Function. I started thinking that I could retrieve the property values, but I couldn’t change them or add new properties. Passing a table as a parameter is still not possible in SQL Server 2005. And that would force me to load the table into a variable, change it and load it back into the property bag. Or I could create functions to Create, Update and Delete properties from the property bag. Or I could just use XML. All it takes is creating a CLR Scalar-Valued Function to convert the property bag to an XML representation and another to convert the XML back to the property bag format. It still makes me load the property bag into a variable if I want to change it, but it’s usable in SQL Server 2005, which was the targeted platform. And it’s all set to go. Unfortunately, the application uses characters that are invalid to SQL Server as XML characters and I can’t use it on that application. I’ll have to understand those values better and add other fields to the table and XML. Don’t ask me why it’s done like this. It just is. The application decodes this property bag into its inner structures and all works fine. Sometimes I would like to query the database directly or do some reporting on those properties and just can’t. So, I thought this was a good use case for SQL Server CLR Integration. I decided to build a CLR Table-Valued Function that would return the property bag as a two column table. Ultrapico’s Expresso was a big help when developing this regular expression. In case you don’t know, the way CLR Table-Valued Function are built is using an initial method to take the input and return an IEnumerable and row filler method the receives the enumerator item and outputs the column values. And all is set to go. Just for curiosity, for a little over 50000 entities (that can be retrieved on about 1 second on my laptop), I got a little under 630000 properties in les then 40 seconds. 40 seconds might seem a lot compared to the 1 second, but I would like to see better times using T-SQL. And develop and test the TVF in just a couple of hours. Now, if only he DBAs would allow me to use it. It doesn’t fit into the company’s “security policy”, you know. The tool space for software architecture has been growing. There are new tools and continuous improvement in the existing ones. Last month Krzysztof Cwalina from Microsoft released the Framework Design Studio at MSDN Code Gallery. The latest release (Lattix 4.1) was released on April 21, 2008. The site has lots of videos (both on the Home page and Getting Started page) and documentation on all the concepts used by the tool. The latest release (NDepend 2.8.1) was released on April 26, 2008. Ensure adherence to design standards in "real time"
The latest release (2008.02) was released on Marsh 26, 2008.